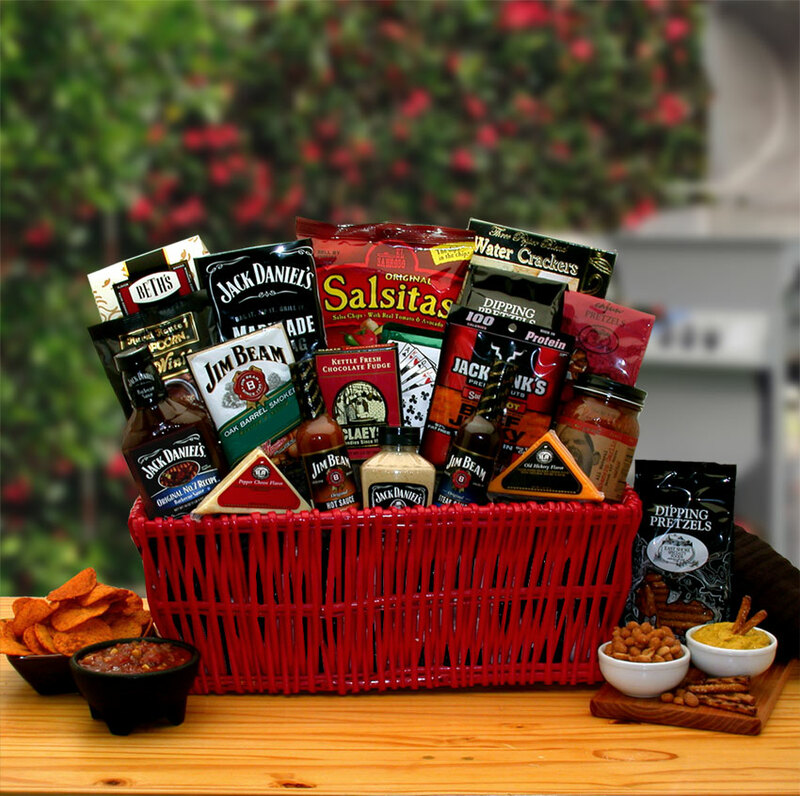 Send a Grilling Gift Basket filled with barbecue sauces, spicy dips, zesty snacks and more! These Barbecue Gift Baskets are sure to please the back yard barbecue gourmet, and, just in case, we have included a few barbecue recipes that may be a welcomed addition to their grilling master pieces. included with all of our Grilling Gift Baskets and Barbecue Gift Baskets! Master Of The Grill Barbeque Gift BasketA classic wicker tray is filled with an assortment of barbecue grilling sauces, marinades, and mouthwatering snacks. Also includes a wooden cutting board, barbecue utensils, and recipe cards. A Little Spice Gourmet Salsa & Chips Gift BasketSome things don't come in small packages. Surprise them in a bog with with our gourmet sampling of chips and salsa. We've included four different flavors of tortilla chips, gourmet Fiesta spicy cheese dip, nacho cheese sauce, salsa's and more. A true salsa lovers dream gift. BBQ Lovers Gift PailThere's a line that seperates the true grill masters from the amateurs. Our BBQ Lover's Pail is only for the true grill master. We've included some tried and true ingredients to deliver the optimum flavors in BBQ as well as few tasty treats for the master to gnaw on while he's working his magic! Macho Munchies CrateSnack Hard! It takes more than a small appetite to tackle the Macho Munchies Crate. This crate is crafted with a deliciously unique sampling sure to please all palates and start you on your journey towards glorious snack nirvana. Our Ghost pepper Tortilla chips will send your taste buds to new heights while the Tabasco jelly Beans will surprise and delight their senses. The Master Griller BBQ Gift ChestSet your favorite griller up this barbecue season with a gift set featuring Classic BBQ Sauce, barbecue kettle chips, beer cheese dip, flammin hot Smokey beef steak jerky and other gourmet goodies. They'll be ready to roll on the grill right now and straight on through the summer!